The long and proud tradition of physical therapy education in the United States Army was born of necessity. No rehabilitation services, civilian or military, existed to meet the needs of American soldiers when we entered World War I. After a quick study of European rehabilitation systems, Army Surgeon General Gorgas consolidated the use of various physical modalities under the term "physiotherapy." His Reconstruction Aide training program was conducted at civilian higher education facilities across the country. The enthusiastic "120-day wonders" who graduated from these emergency programs would later form the nucleus of the American Physical Therapy Association. The Army Medical Department recognized the need for a formalized physical therapy course of instruction during the early 1920s. Such a course began in the fall of 1922 at Walter Reed General Hospital. The course, only four months long at that time, went through numerous changes in length and content in the following two decades. The program received its first accreditation in 1928. The students were civilians, and worked as civilians in military hospitals after graduation. In 1942, therapists were granted relative military rank and graduates could apply for commissions upon completion of the program. Enlisted women were also allowed to become students and then receive a commission. World War II increased the need for therapists, and from 1942 through 1946, the Army course (26 weeks in length) was run concurrently, on a quarterly basis, at not only Walter Reed, but at other locations which included Fort Sam Houston, TX; Hot Springs, AK; Brigham City, UT; and White Sulphur Springs, WV. After the war, the need for therapists declined and the training of new therapists was suspended. The physical therapists already on active duty were included in the newly established Women's Medical Specialist Corps (WMSC) in 1947. The program was restarted in 1948 at which time the trainees were commissioned as second lieutenants during their schooling. The course work was moved to its current location at Fort Sam Houston, TX. Male therapists were accepted into the Corps in 1955 and the name of the Corps was changed to the Army Medical Specialist Corps (AMSC). In 1971, Baylor University and the Army partnered to establish and conduct an entry-level Master's degree program. Curriculum changes reflected the growing role of our profession in the military. Prior to the early 1970s, physical therapists worked in a prescriptive environment during peace time. Then, once again, a major change occurred. After the Vietnam conflict, the Army had too few orthopedic surgeons to manage large numbers of soldiers with neuromusculoskeletal injuries--both battle and non-battle related. Based on our performance record, and on the way we had met the expanded scope of practice required in Korea and Vietnam, physical therapists were identified as "physician extenders," credentialed to evaluate and treat neuromusculoskeletal patients without physician referral. Army physical therapists have been functioning in a direct access setting since that time. The US Army-Baylor University Doctoral Program in Physical Therapy is tasked, therefore, to prepare the student for entry-level competence in all traditional physical therapy skills as well as to emphasize those skills needed as part of the neuromusculoskeletal evaluation process within the military health care system. 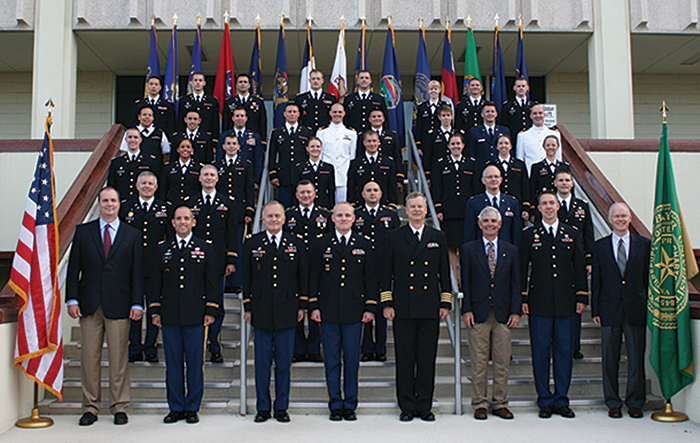 Students are commissioned in the Army Medical Specialist Corps, Navy Medical Service Corps, the Air Force Biomedical Sciences Corps usually at the rank of second lieutenant or ensign and receive the DPT degree upon successful completion of the Baylor University curriculum. In July 2002, the program was approved by Baylor University to transition to granting a Doctor of Physical Therapy (DPT) degree and CAPTE subsequently granted approval for the change. The first Doctor of Physical Therapy class began the program in December 2003 and graduated in April 2006. The program was accredited in 2007 for eight years by the Commission on Accreditation for Physical Therapy Education (CAPTE). The program is scheduled for re-accreditation in 2017. US military PTs have a proud history of providing medical care during operational deployments of US forces. US Army PTs were first placed in the 75th Ranger Regiment in 2000, a move that positively influenced medical readiness of the battalions. Subsequently, PTs were assigned to Special Forces Groups, Naval Special Warfare units, and Army Brigade Combat Teams. Over the 10 year period from 2001 to 2011, 162 Army PTs deployed to Iraq or Afghanistan with an estimated 222 deployments. This effort has reduced unnecessary medical evacuation of service members with musculoskeletal injuries approximately 18%. Military PTs are functioning in a primary care direct access role and managing musculoskeletal injuries and providing evidence based PT care within a model coined by Colonel Josef Moore called "Sports medicine on the battlefield."